Often times when we speak of leaders or leadership, the tendency is to look at leaders who are in the secular world. We are grateful to those men and women who brave the front line and are able to execute their duties and their responsibilities sometimes under the most extreme pressure. Today however, for the Power of Gratitude 7 Day Challenge, this being day 3, we are thankful for all our spiritual leaders. They are not in office by their own choosing. These are men and women of the faith chosen by God. The Bible says we are not to worship them as though they are God but we must submit ourselves under their leadership, to obey them because they watch over our souls each day and must also give an account to God for us. The job of spiritual leaders are never easy and they are constantly under pressure and under the microscope as their lives must be lived as a true reflection of God. People sometimes forget that they too are human and they are capable of making mistakes and are in need of God’s mercy and grace just like all of us. So let us show our appreciation to all our spiritual leaders as the ones who help us to grow spiritually. Let us be thankful to God for them. They are His servants, as well as servant leaders to the people they lead. Encourage them in the faith and likewise, let us pray for them as they continue to do the work of the Lord. Remember to pray daily for all our spiritual leaders. 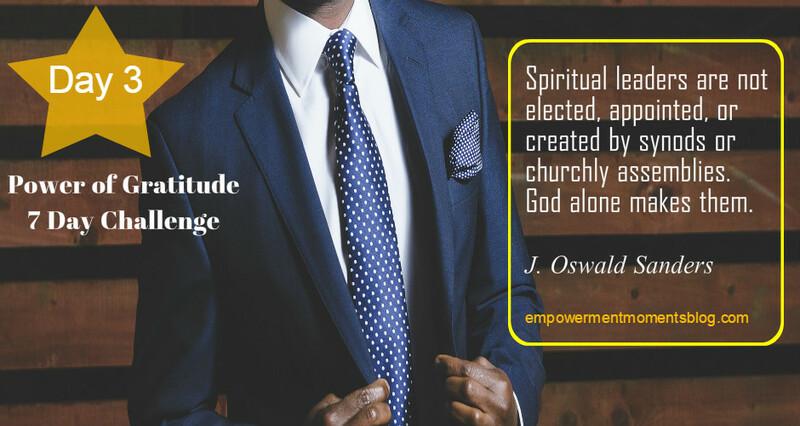 Identify one spiritual leader [could be your Pastor] who is most influential in your life and send a thank you note to that person. I give God all the glory and praise for having someone like you – Yvonne Wilson, in the congregation of the righteous. I pray that 2016 will be the year of Jubilee and Release for you. May God bring you a fresh anointing to sustain you in your calling. May He put a fresh pep in your steps that you will run and not get weary, and that you will be able to walk and not faint. Bless you woman of God. Happy New Year!!!! Mighty woman of God. Thank you from my heart for your kind words of encouragement and the blessings spoken over my life, which I gladly receive. Thank you for being a genuine and true leader. I am happy to be under your leadership. May the blessings and favor of God be made manifest in your life. May He continue to strengthen and guide you. May your ears hear and bring the sound of heaven down to God’s people and may your eyes be aligned for 20/20 vision and accuracy in the spirit realm. God bless you always. Have a great day/week.